PARIS, France (Sporting Alert, Full results) — World record holder and Olympic champion Usain Bolt fired to a world-leading 19.73 seconds to win the men’s 200m at the 2013 IAAF Diamond League meeting in Paris on Saturday. Bolt, who continues to improve with every race this season, got off to a quick start and pulled away from his challengers in the last 50m, to improve on the 19.74secs previous world-leading mark of Tyson Gay set at the American trials. 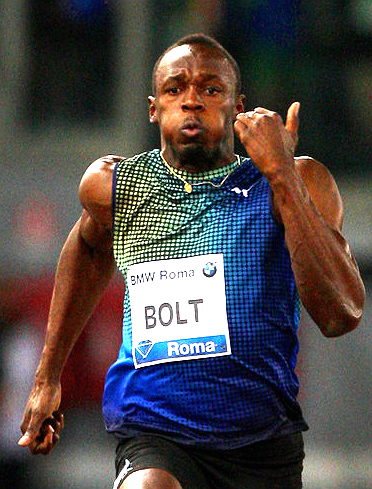 Bolt’s time also bettered Michael Johnson’s 20.01 meeting record, set in 1990. Jamaican champion and Olympic bronze medallist Warren Weir, who pushed Bolt all the way up to 150m before seeing the reigning world champion moved away, clocked 19.92 for second place, with French star Christophe Lemaitre taking third in 20.07. Olympic champion Shelly Ann Fraser-Pryce, meanwhile, just held off a fast finishing Blessing Okagbare of Nigeria to win the women’s 100m in a season’s best of 10.92 seconds (-0.2 m/s). The Jamaican got off to a modest start by her standards, but managed to take the lead midway through the race before holding off Okagbare, who leaned too early and had to settle for second, but in a seasonal best of 10.93. Murielle Ahoure of Ivory Coast took third in 11.01, with world-leader Kelly-Ann Baptiste of Trinidad and Tobago, fourth in 11.13. USA champion English Gardner ran 11.13 for fifth. Olympic and World champion Kirani James of Grenada produced the first sub-44 seconds time of 2013 when he clocked a world-leading 43.96secs to win the men’s 400m dash over arch rival LaShawn Merritt of USA. James came off the last bend with a slight advantage and when challenged in the homestretch by Merritt, responded with a late surge to hold off the American champion and avenged the defeat he suffered in their last clash at the IAAF Diamond League meeting in Eugene, in June. Merritt posted a seasonal best of 44.09 for second and his fellow countryman Tony McQuay coming home third in 44.84. Zuzana Hejnova of the Czech Republic dominated the women’s 400m hurdles on her way to setting a new national record of 53.23secs to win the event. Hejnova, who was just 0.02 seconds off the world-leading mark of American Kori Carter, entered the home stretch in the lead and went on to open up that gap in the last 100m. Great Britain’s Perri Shakes-Drayton was again under 54-seconds after coming home second in 53.96, with third place going to Georganne Moline of USA in 54.19. In other action on the track, Tirunesh Dibaba of Ethiopia won the women’s 5000m with a world-leading and meeting record time of 14:23.68. She paced home four other countrywomen, including Ayana Almaz, who ran a massive personal best of 14:25.84 for second, Gelete Burka (14:42.07) and Sule Utura (14:59.74) – and all dipped under the 15 minute barrier. The women’s 800m went to the dominant figure of Francine Niyonsaba of Burundi, who pulled away from the pack to win in 1:57.26. There were also some impressive placing times behind the world-leader was Moroccan Malika Akkaoui (1:57.64, PB), Alysia Montano of USA (1:57.75, SB), Kate Grace of USA (1:59.47, PB) and Great Britain’s Marilyn Okoro (1:59.76, SB), who all ran world championships qualifying A standards. Two-time Olympic champion (2004 and 2012) Ezekiel Kemboi of Kenya produced a world-leading and meeting record of 7:59.03 to take the men’s 3000m steeplechase, becoming the first man to break the eight-minute barrier in 2013. He pulled with him Mahiedine Mekhissi-Benabbad of France who set a new European record of 8:00.09 for second, while world-leader Paul Koech of Kenya looked well off the pace with 8:09.17. Reigning World and Olympic champion Valerie Adams continued her good form this year with another impressive win on Saturday after she took the women’s Shot Put throw with an effort of 20.62m. The New Zealand thrower easily topped American Michelle Carter, who did 19.57m and Nadine Kleinert of Germany who finished with a best effort of 17.95m. Adams leads the world with a 20.88m mark. Caterine Ibarguen of Colombia, the Olympic silver medallist in London in 2012, won the women’s triple jump with a measure of 14.69m. Hanna Knyazheva was second with 14.58m, with world-leader Olha Saladuha finishing third with a jump of 14.55m. Kimberly Williams of Jamaica finished fourth with a season’s best of 14.48m. The experienced Christina Obergfoll of Germany won the women’s Javelin throw with 64.74m. She beat Australian Kimberley Mickle, who set a new personal best of 64.35m. Olympic champion Anna Chicherova easily won the women’s high jump with a clearance of 2.01m. She failed on three attempts at 2.05m, which would have been a new world-leading mark. Brigetta Barrett of USA, the world-leader (2.04m) and Croatian Blanka Vlasic, both cleared 1.98m for the other podium spots. Jamaican champion Damar Forbes won the men’s long jump with a leap of 8.11m, while Renaud Lavillenie of France bounced back from his no mark outing in Lausanne to take the men’s pole vault with a clearance of 5.92m.